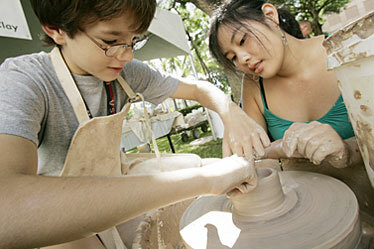 London Opendack, left, tried working a pottery wheel yesterday with the help of Kelli Koga, a UH student volunteer, at the Hawaii State Art Museum's Second Saturday event, a day of art demonstrations and entertainment. The "O Joy to the World" children's fair at Hanahau'oli School yesterday in Makiki featured entertainment, food and crafts. 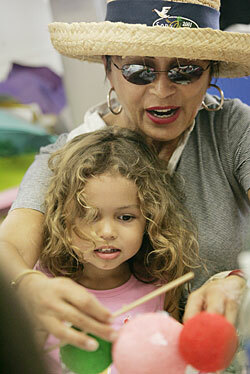 Here, Terri Lui helped granddaughter Paris Anderson craft a Mickey Mouse.